I quilted the block using 2 layers of batting for added structure and did very dense quilting which also tends to add stiffness. I lined it with a red batik look fabric. I decided it would look more interesting to not center the large snowflake so I made it sort of wrap around the bag. Now that I have it made I realize I should have take pictures of the steps so I will try to get another one done this week and get pictures and write up some instructions . I did the quilting and bag construction on my Montgomery Ward machine ( made in Japan in the 60’s). I bought this machine because I wanted the cabinet that it came in. The machine itself was a bit of a mess and I almost asked the people at the antique mall if I could just take the cabinet and leave the machine . It was rusty and it would not move at all. I decided to give it a chance and cleaned and oiled it and it came back to life. I have still have the motor attached to it but I use it in one of my treadle bases. This one takes singer 15 bobbins and standard needles. it is easy to get different feet for it because they are standard low shank feet. It makes a great zig zag stitch, the feed dogs drop, makes a great straight stitch and I love the color. The cabinet and machine were 20 dollars….it is now one of my favorite machines. I started to do some work on another hand quilting video. I am working on trying to figure out the best camera angle and how to keep my hands out of the way….not an easy task! One more thing today because it is close to thanksgiving and I have been thinking about all the things I am thankful for. I have to thank those who donated to the blog. For privacy reasons I won’t name you publicly but I truly am thankful for your support! Your donations have gone directly to the blog costs. 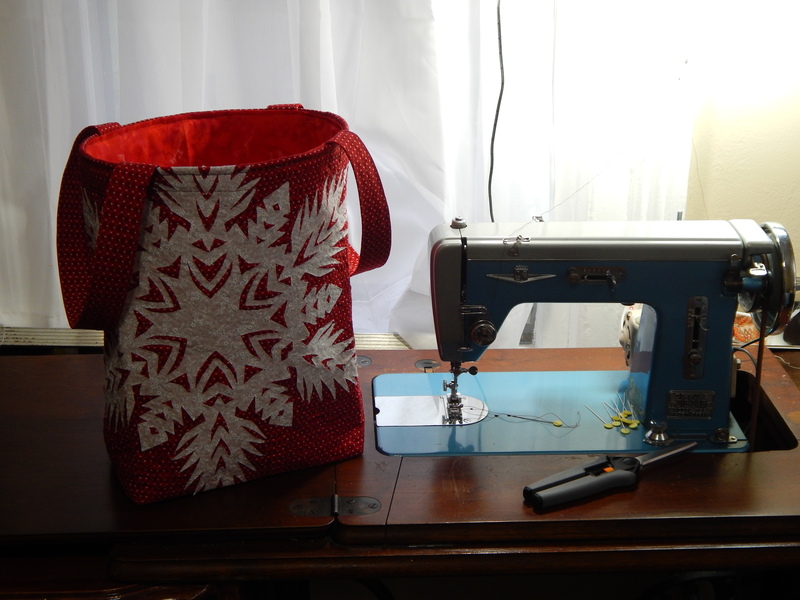 This entry was posted in Quilts and tagged hand quilting video, Snowflake, tote bag. So wonderful to see your work and that you’ve taken time to create the videos – very inspiring. I am always amazed! What a gift. thanks so much! Thanks Tim,your videos are invaluable – information so explicit. Is the tote bag for sale ? That sewing machine looks like the very first machine I ever had but it was not a Montgomery Ward but I guess they might have been made at the same place with different names. I also think you have the cutest quilt inspector there is! I seem to post the same thing every time on your blog…but wow…just wow. Your work is truly inspiring. I love this. So very beautiful! I would but this tote bag! Is it for dale? Glad you’re feeling better. Thanks again for sharing your work.